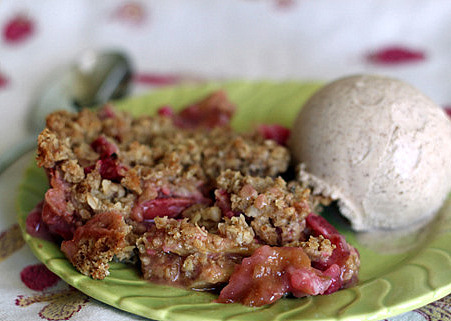 Tart and crunchy rhubarb crisp, just like you remember. 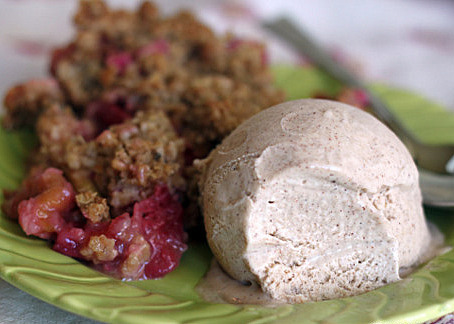 When served alongside decadent cinnamon-flecked ice cream, it's spring dessert nirvana. My grandmother, or “Gran” as we called her (but never “Granny,” mind you, as that sounded far too old for her tastes), had the most wonderful garden. As a child, it was nice, sure … but unremarkable to me in the way that whatever we grow up with, no matter what it is, is simply the norm. Conversely, as an adult, now I look back and remember her garden in that larger-than-life way that we adults sometimes remember scenes from our childhood. Either way, that garden really was terrific. It took up a good half of her substantial yard, maybe more, as I remember it. A long swath inside the fence was dedicated solely to rhubarb. Whenever we visited in the springtime, we’d leave with a big brown paper grocery sack full of it, giant leaves spilling over the top. I have yet to grow any rhubarb in my yard – a shame, I know. But I buy it at my favorite grocery store this time of year, and the color, the smell, and of course the taste (mmmm, the taste) all take me back to all those times so many years ago when I’d follow my rhubarb-chopping-machete-wielding Gran out to the garden where she’d hack away at the stalks and fill up our grocery sack. So naturally, this Rhubarb Crisp reminds me of my Gran, who passed away right around this time of year, several years ago. And who I always miss. In a small bowl, beat the eggs and set them aside. In a small to medium size saucepan over medium-low heat, stir together the whipping cream, 1/4 cup of the milk, and one cup sugar. Stir frequently until the mixture begins to simmer. Remove from heat. Whisking the eggs briskly (so that they don't scramble), slowly pour half of the warm milk and sugar mixture into the eggs. Pour the egg mixture back into the saucepan, and add the remaining milk. Cook on medium low, stirring constantly, until the mixture thickens and coats the back of the metal spoon. Remove from heat, then stir in the vanilla and cinnamon. Freeze according to your ice cream maker instructions. We have the Cuisinart ice cream maker, and it's terrific. Generally you can serve directly from your ice cream maker for more of a soft serve texture, or you can freeze it for a harder ice cream. 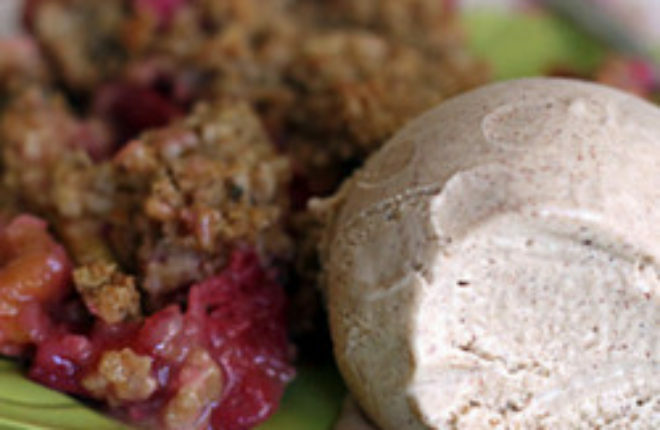 Serve a scoop alongside some warm Rhubarb Crisp. Place the rhubarb into a smallish baking dish - mine is about 5" x 8" and it works great. 9" x 9" works fine, too. Sprinkle the rhubarb with the sugar and 2 tablespoons flour. Toss well. In a food processor, add the 1/4 cup flour, brown sugar, oats, and cinnamon. Pulse to combine, then add the butter, and continue pulsing until the butter is pea-sized. Sprinkle the flour/oat mixture over the top of the rhubarb. Bake for about 35 minutes, until rhubarb is tender when you poke it with a fork, and the top is crisp. 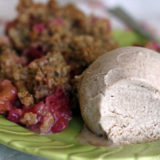 Cinnamon Ice Cream adapted from All Recipes. Rhubarb Crisp adapted from Martha Stewart. I love cinnamon ice cream. It reminds me of my childhood. Looks fantastic! well, first and foremost, cinnamon ice cream is the cat’s me-OW. secondly, i’ve never seen rhubarb used by itself–it always seems to be paired with strawberries or something else. lovely crisp and amazing ice cream!